Vobal is participating in the Internet of Things - North America conference in Chicago, Illinois. Vobal will share unique capabilities and perspectives for supporting M2M applications in the commercial maritime market, such as container monitoring while at sea. 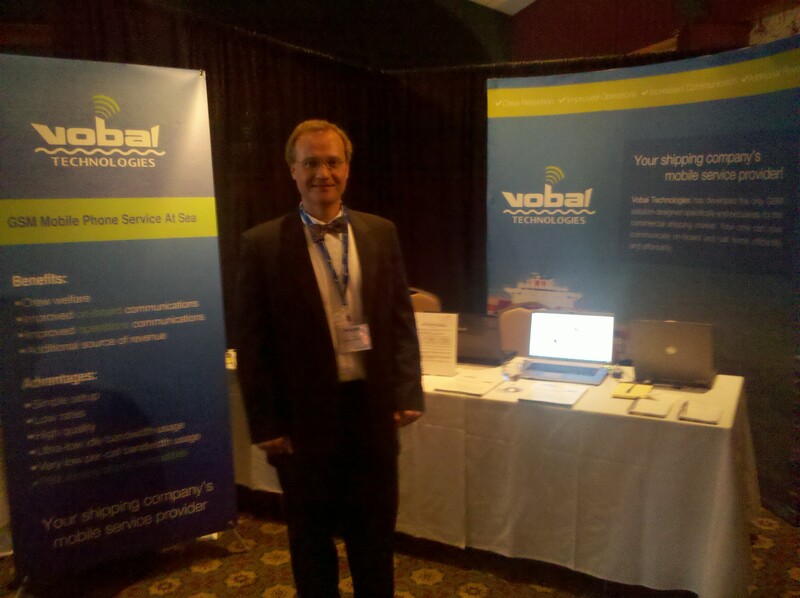 Vobal's CEO, John Nix, presented at the Internet of Things conference in Chicago, Illinios. The presentation focused on both the present status and the future of embedded SIM cards with remote provisioning, focusing on applications for "Machine-to-Machine" (M2M) communications. Embedded SIM cards will support changing the home mobile operator network without physically swapping out the SIM card, including devices that may already be deployed globablly. The presentation, titled "Costs and Benefits for Embedded SIMs" can be viewed or downloaded here. We exhibited at the Intermodal Europe 2014 show in Rotterdam, Netherlands. We met with existing partners and new potential customers regarding CargoGSM. Discussions focused on Vobal's unique capabilities for collecting Reefer data on container ships with L-band satellite connections, which are not supported by traditional BTS for mobile data service. New partner announcements and customer wins are expected in the coming months. We exhibited at the 4th Annual Thuraya Product Development Forum conference in Dubai, UAE with our partner Global Marine Networks. Our discussions focused on new releases of Vobal's VoIP service for maritime L-band networks. We attended the Internet of Things North America conference in Milwaukee, WI. Vobal's CargoGSM solution provides a mobile network at sea for M2M and IoT devices to connect, where otherwise there is no cellular network in international waters. Areas of focus for the M2M industry include security, power efficient radio modules, flexible SIMs, and software defined radios. The roadmap for CargoGSM will support these features and will continue to evolve as long-term industry trends become clear, especially for maritime. We visited the CMA Shipping 2013 show in Stamford, Connecticut. We met with distributors and potential customers to discuss S2 VoIP, S3 GSM, CargoGSM, and our newest VoIP offering: low-bandwidth VoIP with Forward Error Correction. Based on meetings at the show, by early April Vobal successfully completed our first installation of Vobal's new VoIP service, supporting analog telephone adapters directly over FleetBroadband Standard IP! Missed us? Visit this page to sign up for a free demo of the VobalFEC technology. We're back at one of Inmarsat's Global Partner Conferences, this time the Maritime-specific one in Miami. Read all about the Inmarsat Partner Program here. Hope to see you there at our booth (#14)! We'll be talking about our low-bandwidth VoIP and GSM solutions as well as introducing our new CargoGSM(TM) extended network. Exciting stuff! We headed back to the CMA's Shipping 2011 show, this time as presenters. We presented a seminar called Introducing Vobal GSM: Cheaper for Crew and Cheaper for You! on Tuesday at 10am and Wednesday at 2pm. We were also generously hosted at the Telaurus (now Globecomm Maritime) booth. We went back to the IIT VoIP lab, this time at their premiere event: the 6th Annual IIT VoIP Conference and Expo. The Digital Ship USA Conference was a terrific event! Here's a picture of John at our booth. John presented at the Illinois Institute of Technology's VoIP Roundtable discussion. It was very well received. Lots of people there asking lots of really good questions. John thought he wouldn't need the full two hours, but the interest level was so high, he used up all the time. We went to Shipping 2010 in Stamford, CT. Shipping 2010 is North America's premier international shipping and trade conference and exposition, produced by the Connecticut Maritime Association (CMA). It was an excellent event and we met a lot of great companies. Hope to be there next year! © 2014 Vobal Technologies LLC. All Rights Reserved.